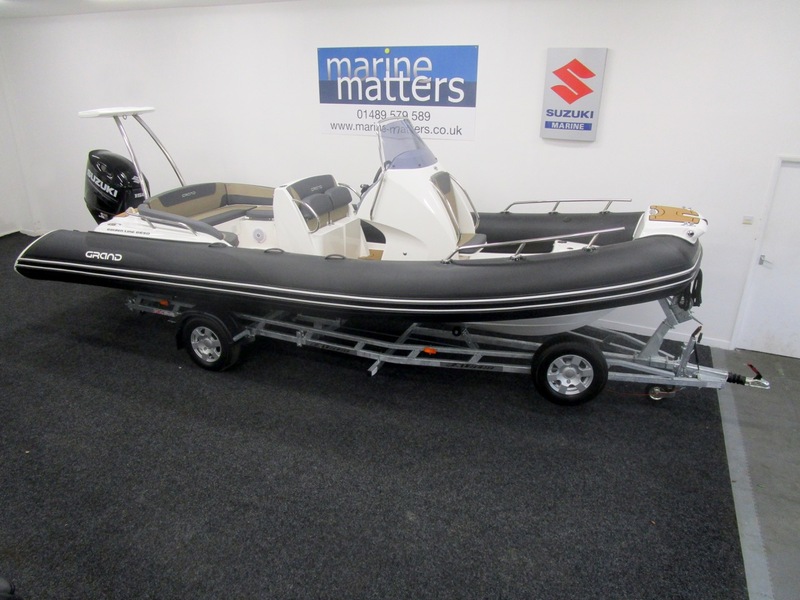 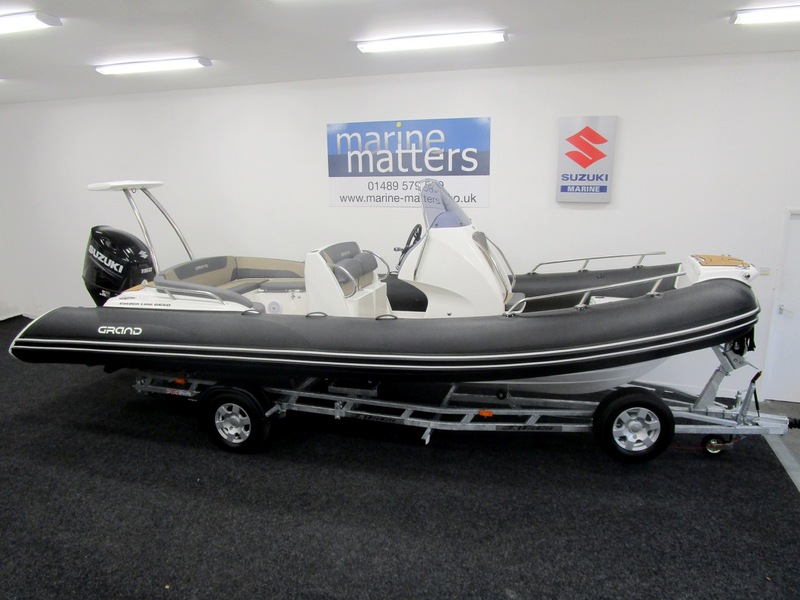 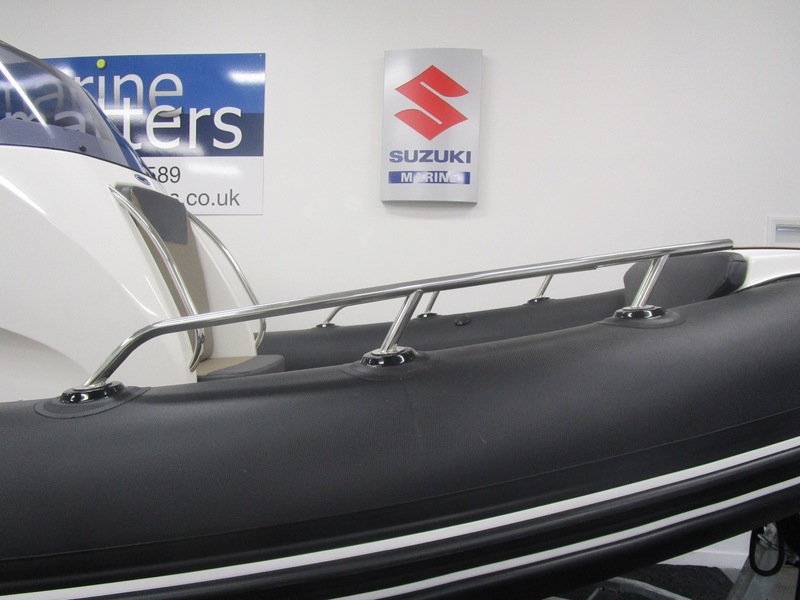 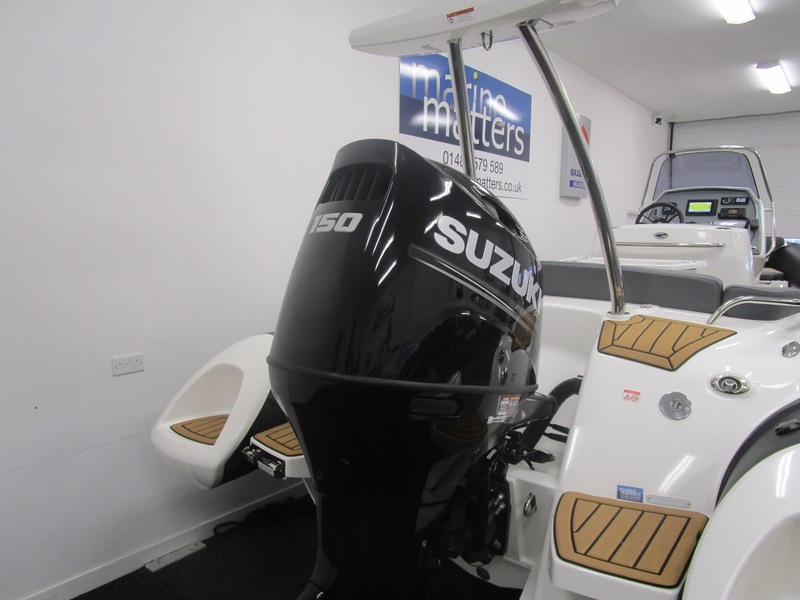 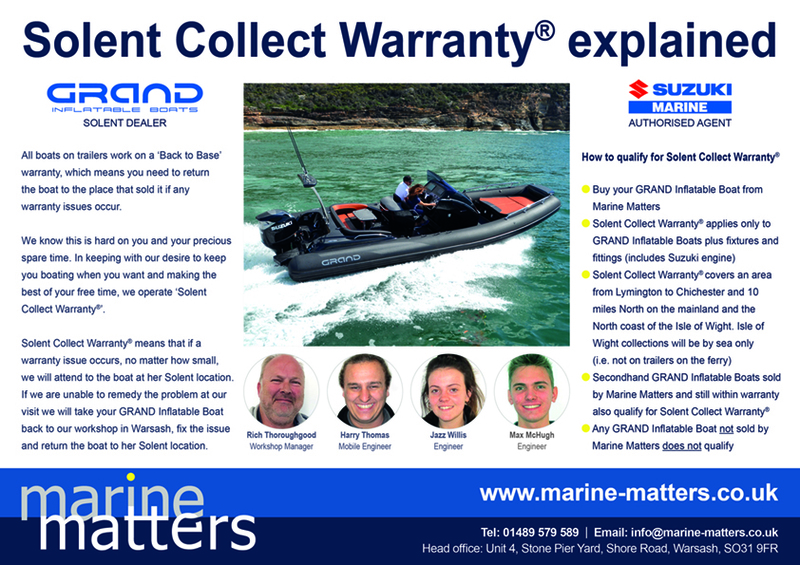 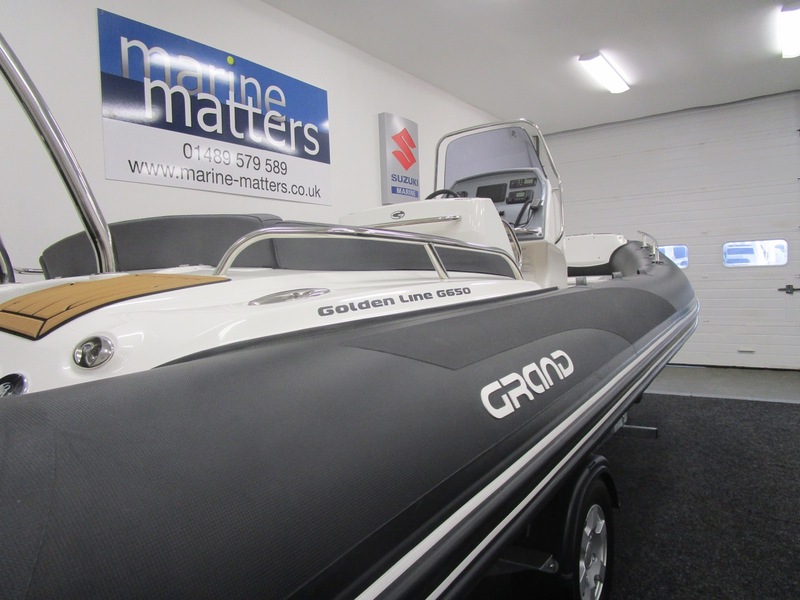 When purchasing this Grand G650 RIB from Marine Matters it comes with our unique Solent Collect Warranty® plan. 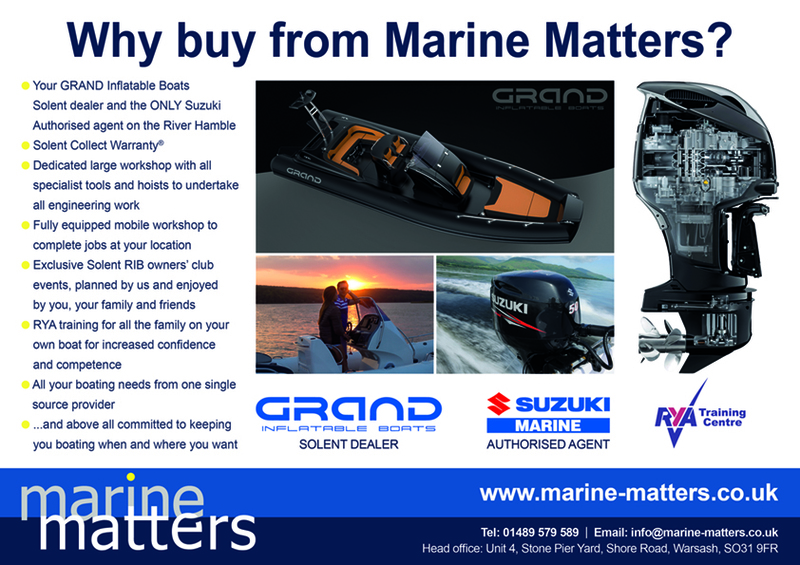 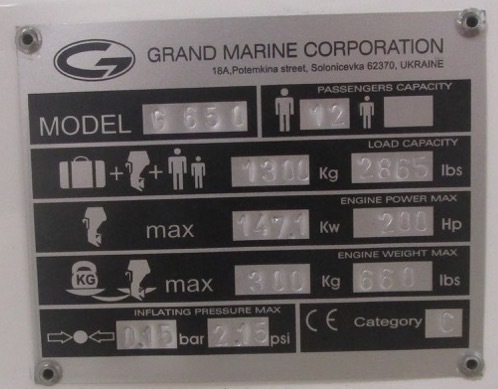 This means that any issues, no matter how small, we will attend and solve the problem, if this can't be done at your location we will take your Grand G650 RIB to our workshop, repair it and return it all free of charge. 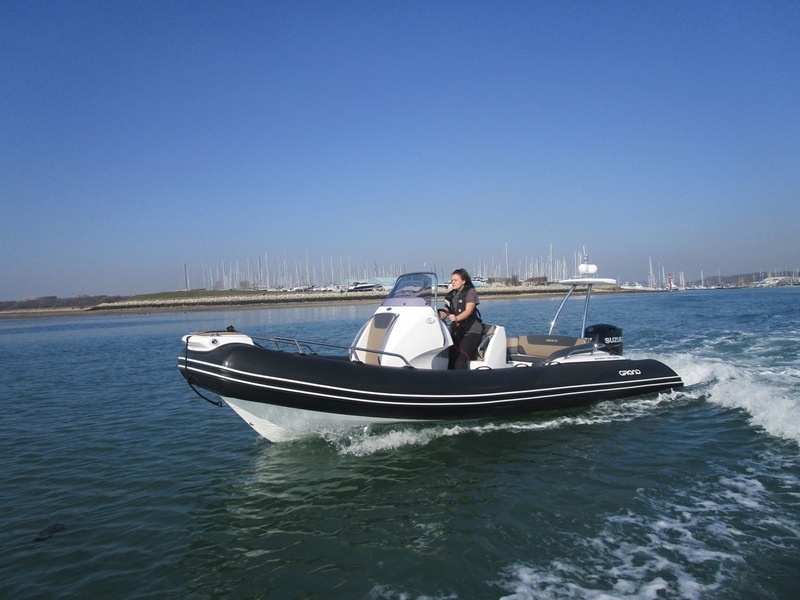 We do the running and jobs while you simply enjoy your Grand G650 RIB without any of the hassle. 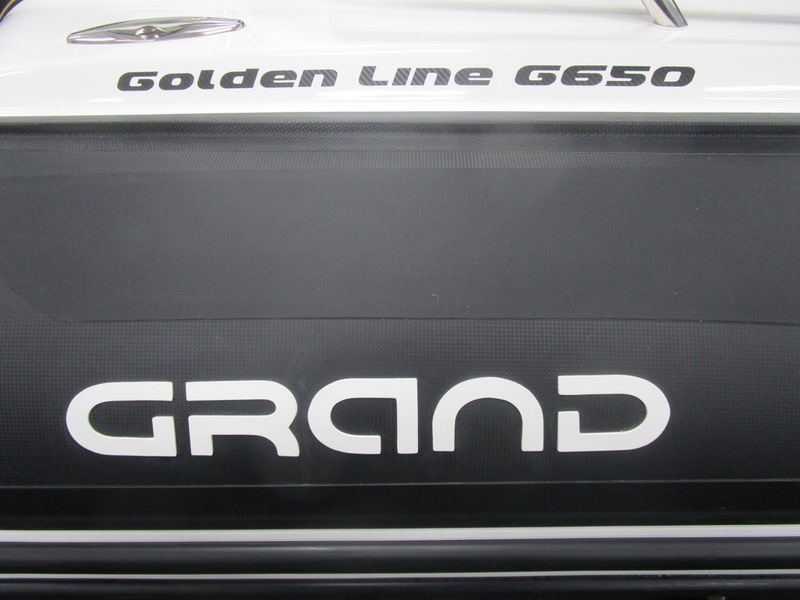 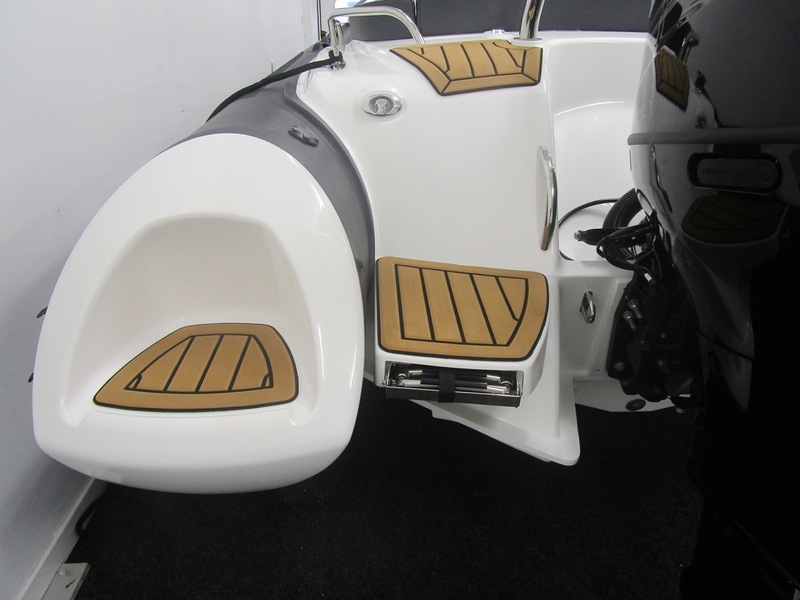 The GRAND Golden Line G650 RIB powered by a Suzuki DF150APL is in a class of her own with her beautiful lines that makes her the luxury choice for any new RIB owner. 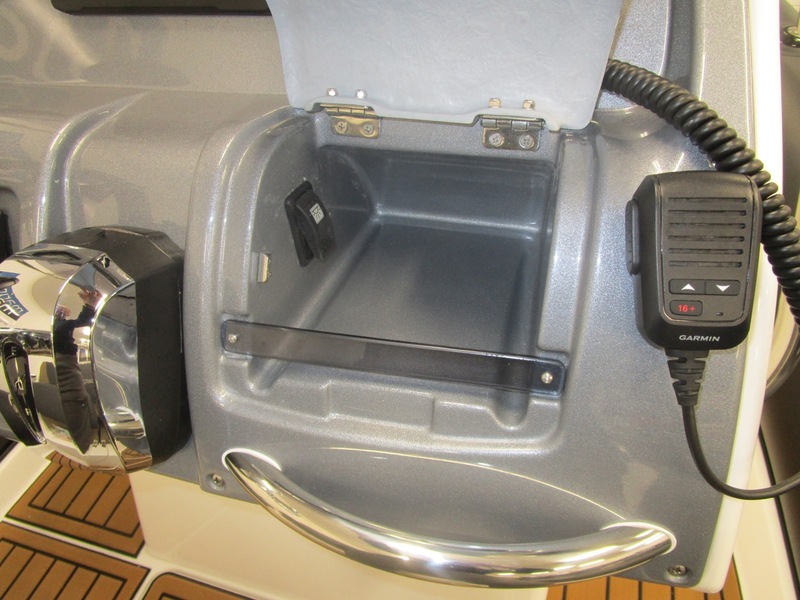 She has secure seating for eight people behind the console. 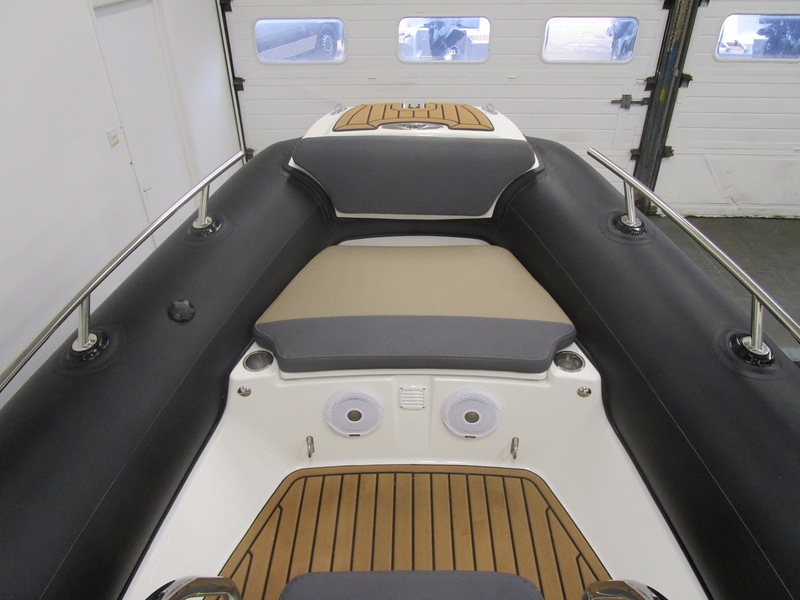 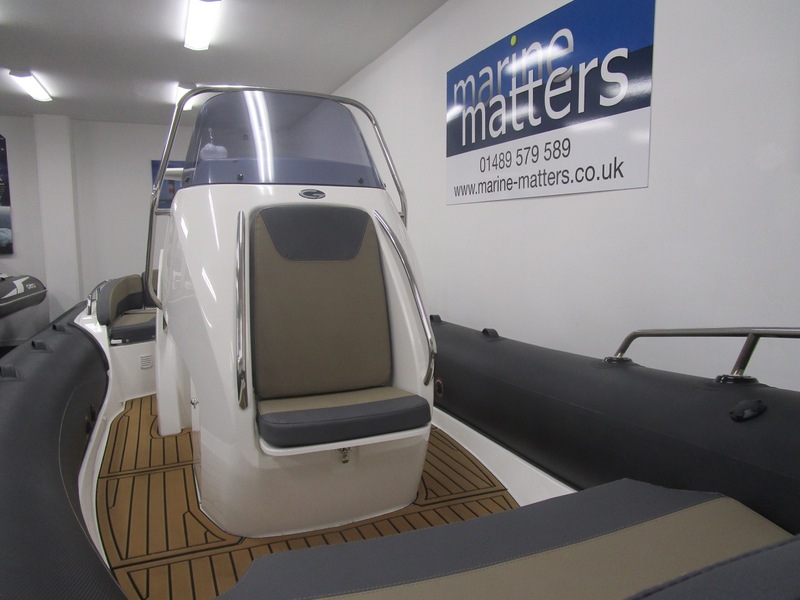 This is provided by the double helm seat, which converts to individual bolster seats for comfortable and secure stand up helming, and the comfortable U-shaped rear seat designed for six adults - an industry first on a 6.5m RIB. 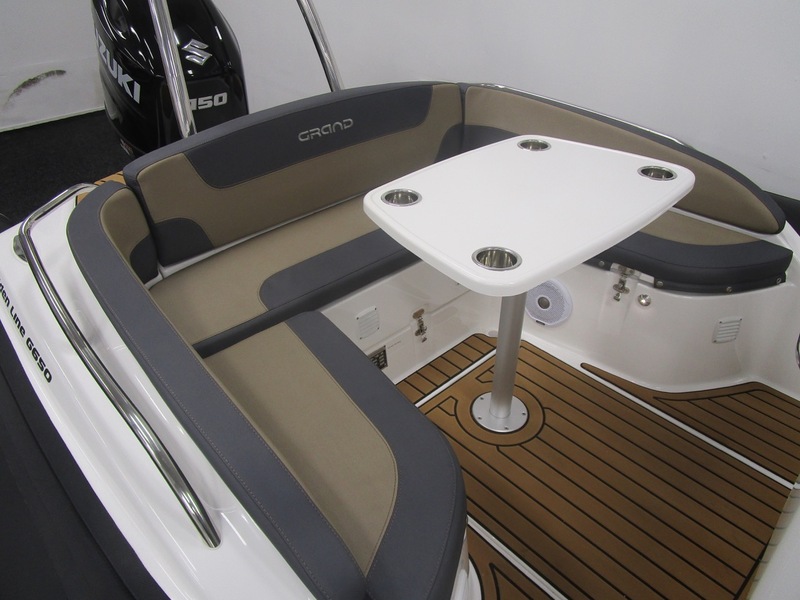 The shaped table ensures the happy mix of table space and leg room for additional comfort. 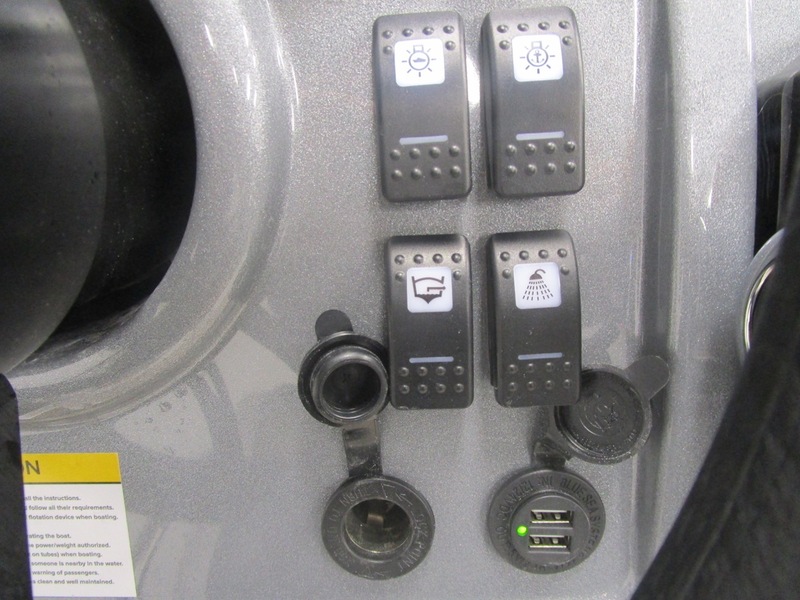 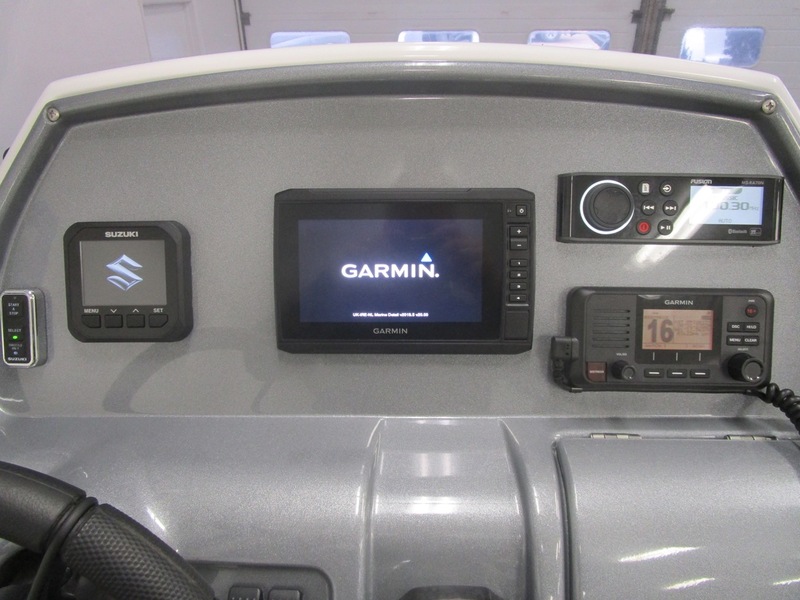 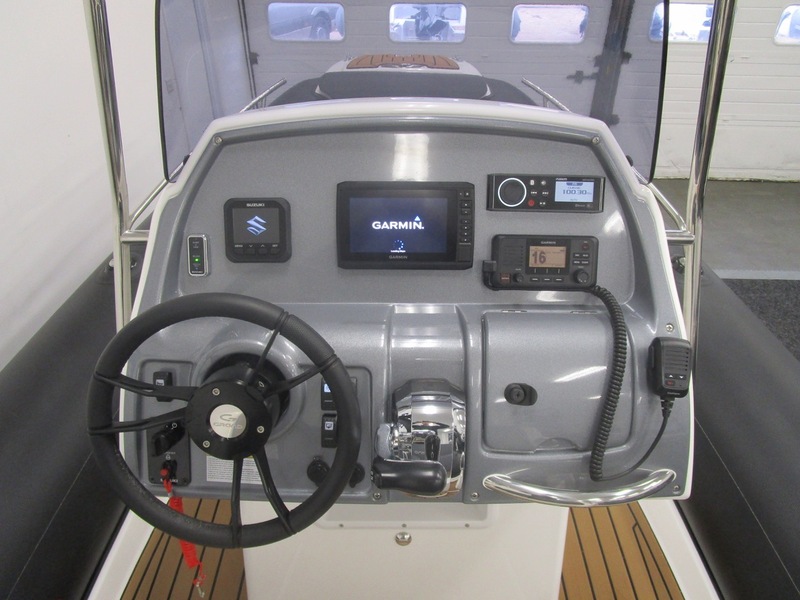 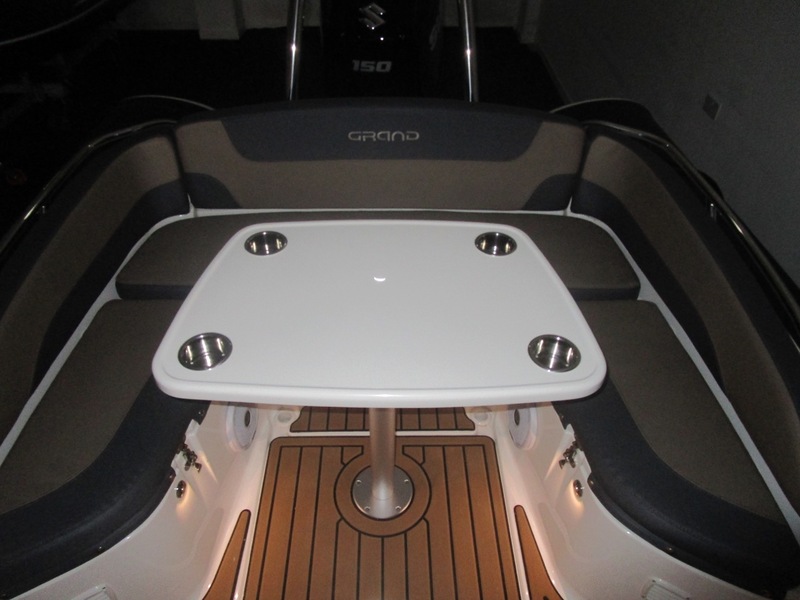 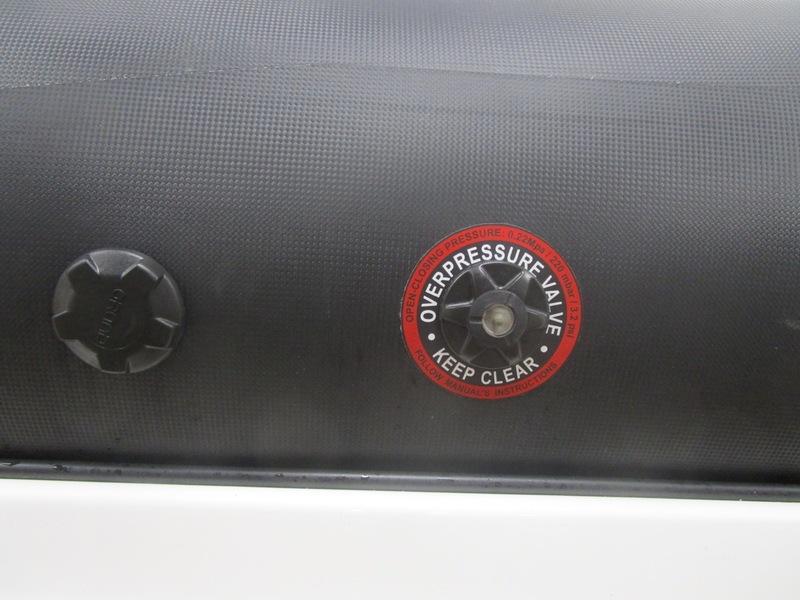 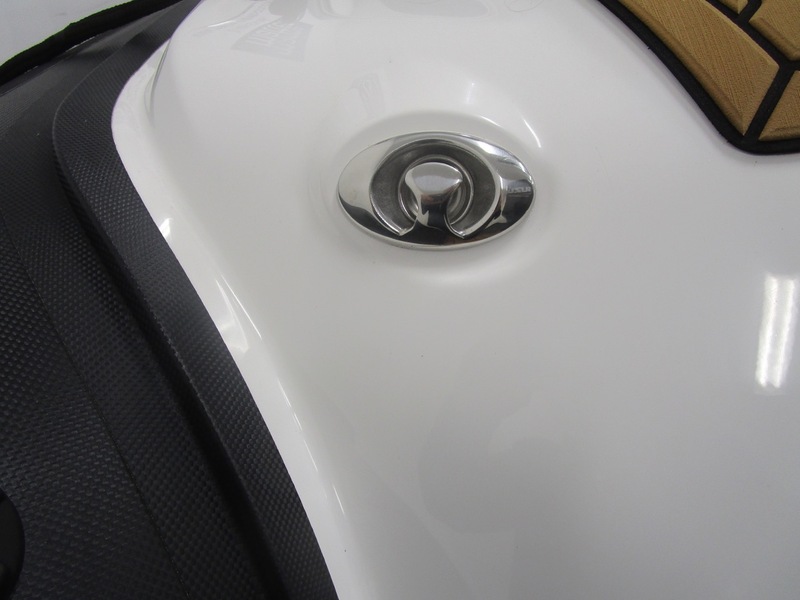 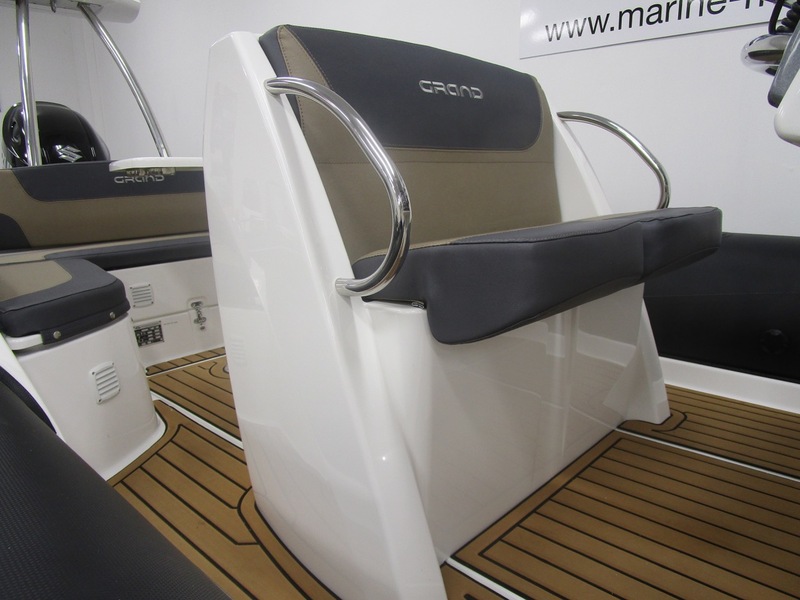 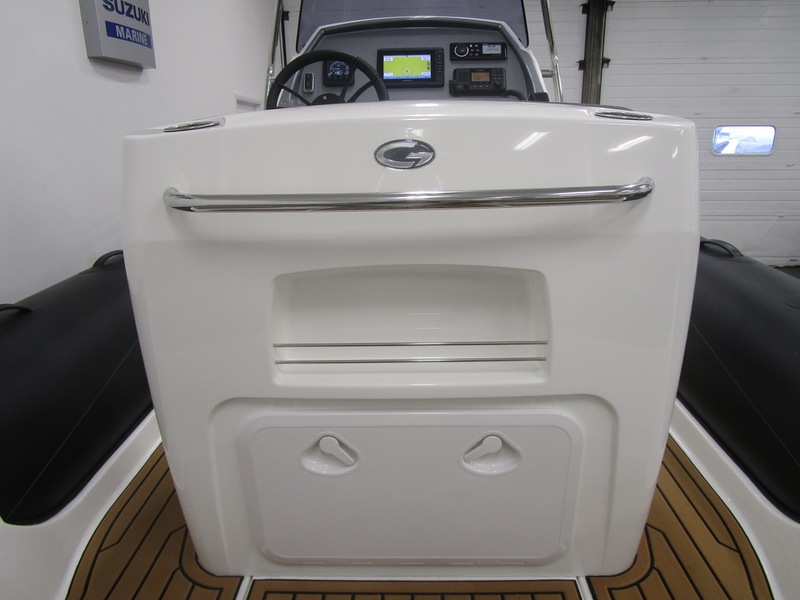 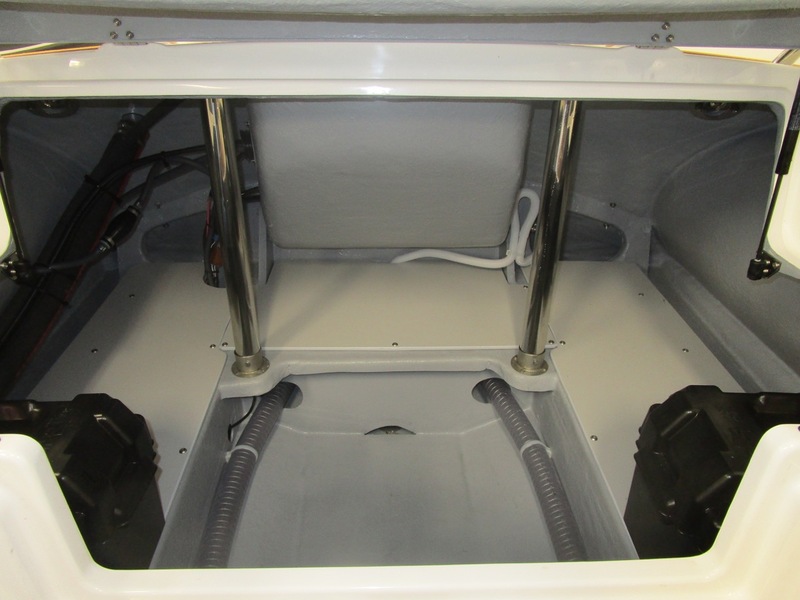 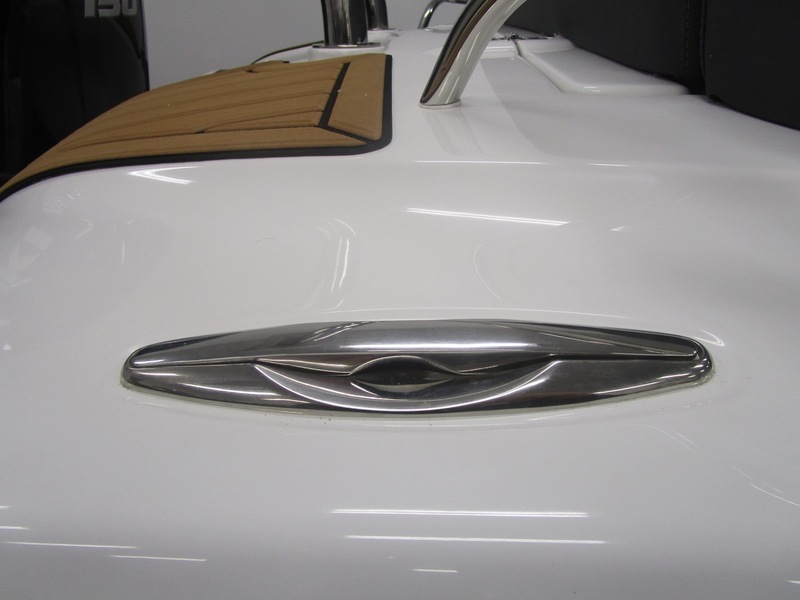 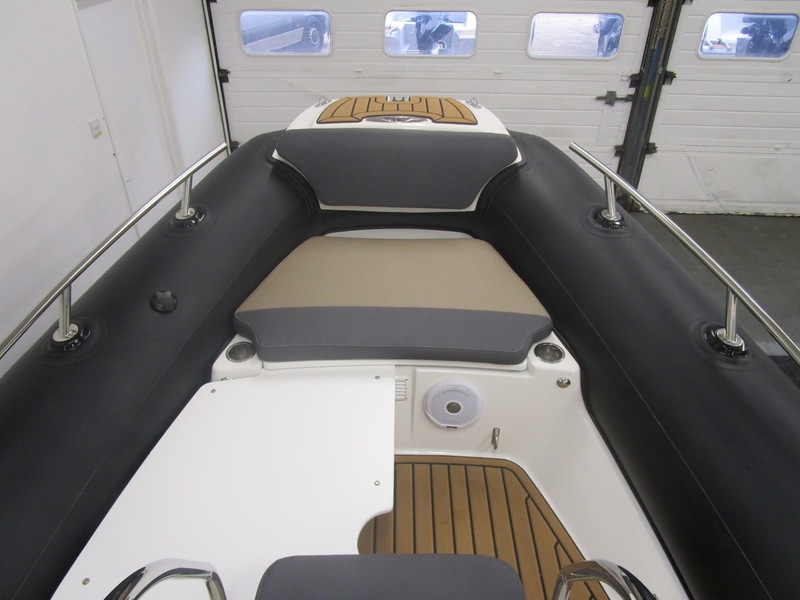 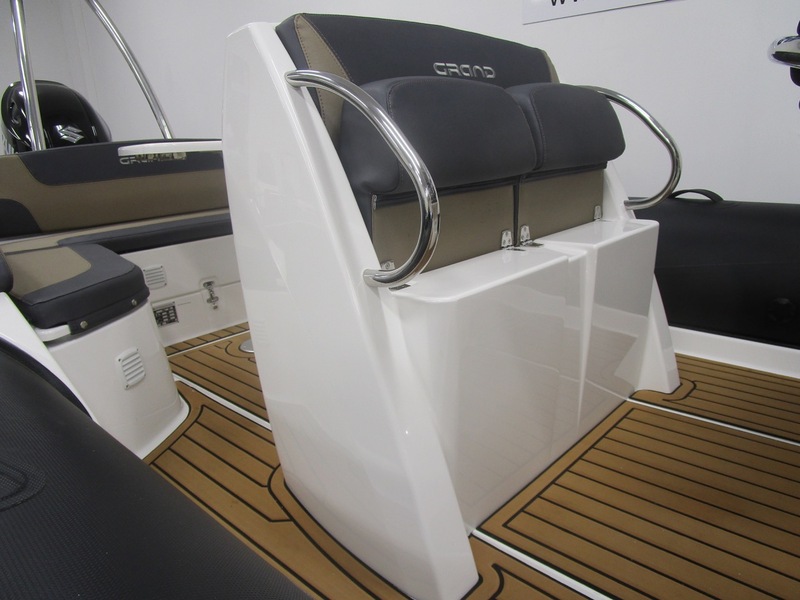 The rear seat has added security provided by the handrails to allow you to move around the boat safely, even at speed. 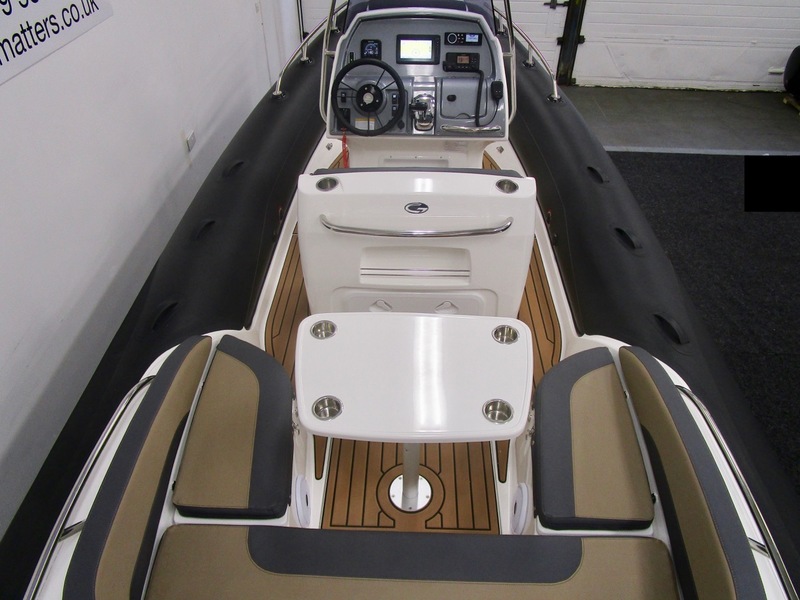 She also has a shaped seat on the front of the console and a double seat in the bow that feels like an armchair with the GRAND RIB square bow tube to lay back against - which of course has a silvertex cushion as well. 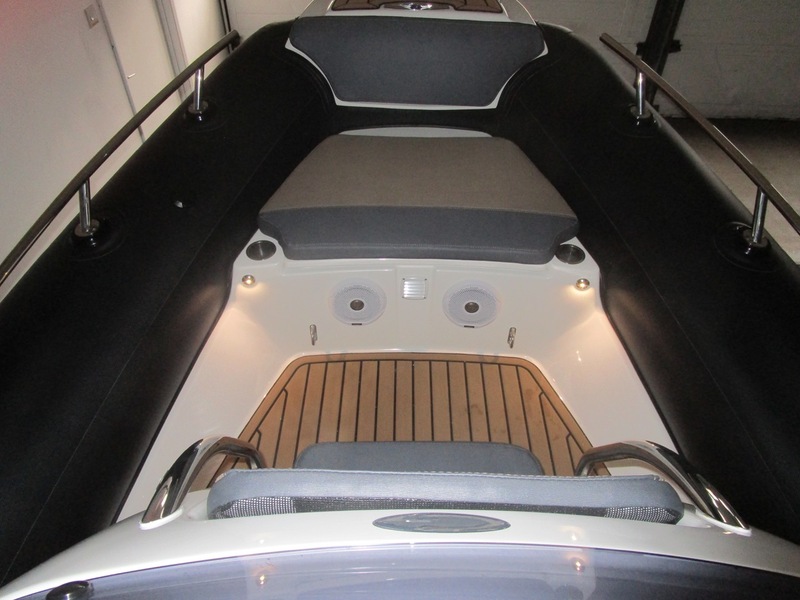 When utilising the sundeck (stored under the rear seat) the whole front of this RIB becomes a sunbathing platform. 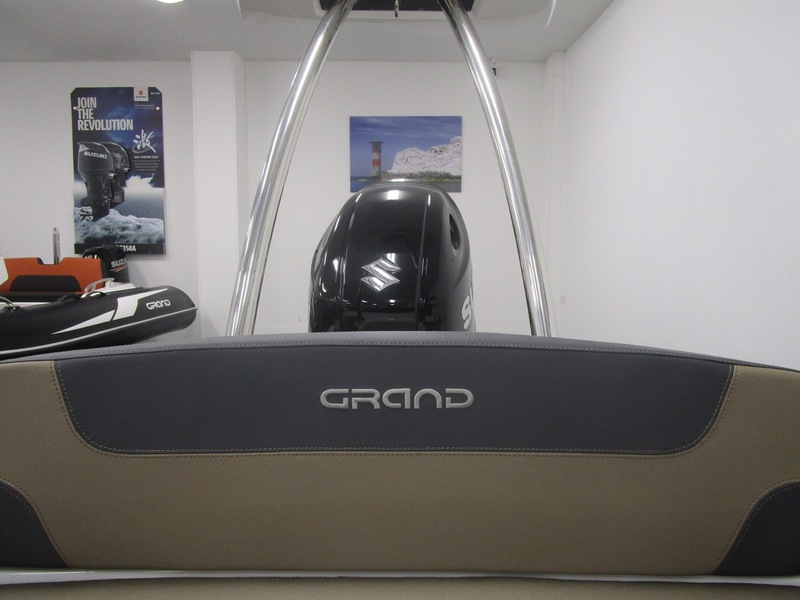 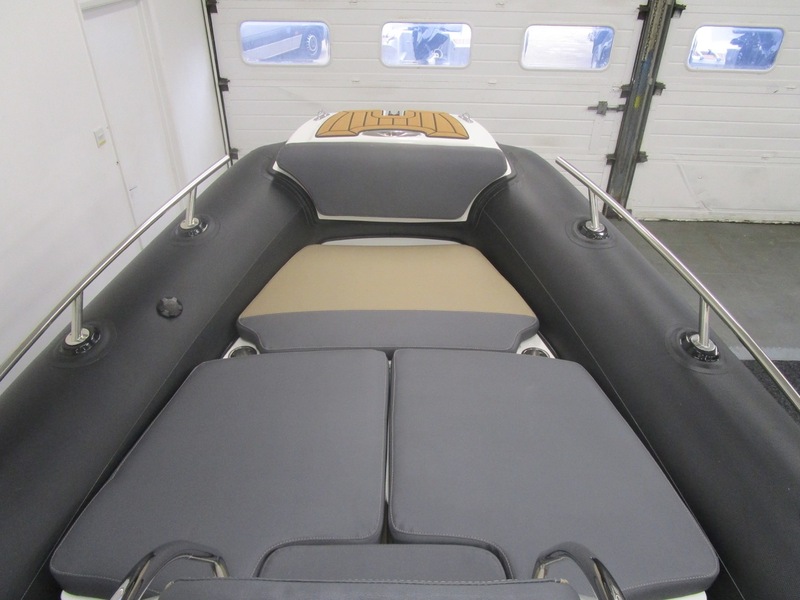 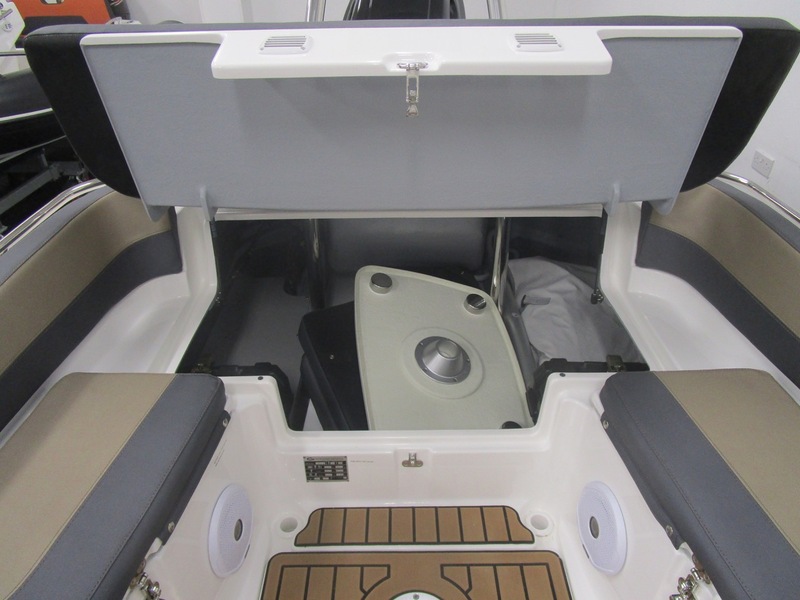 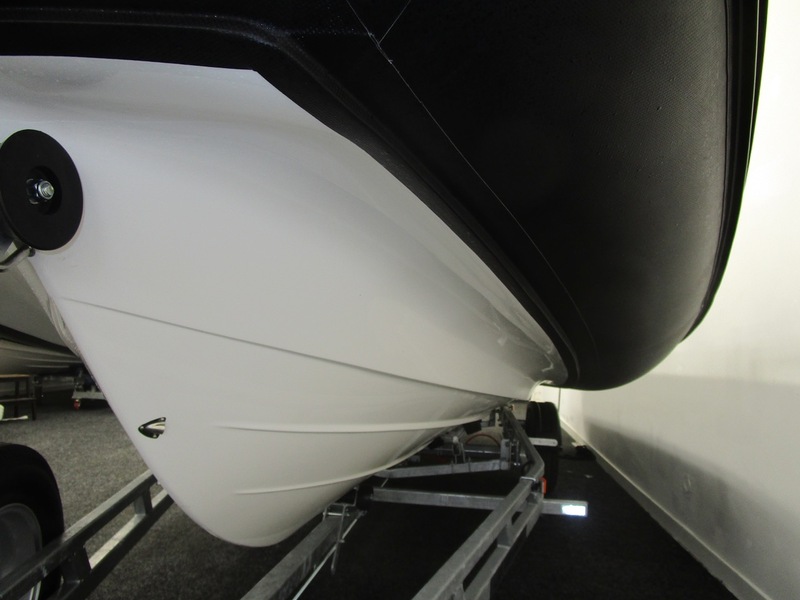 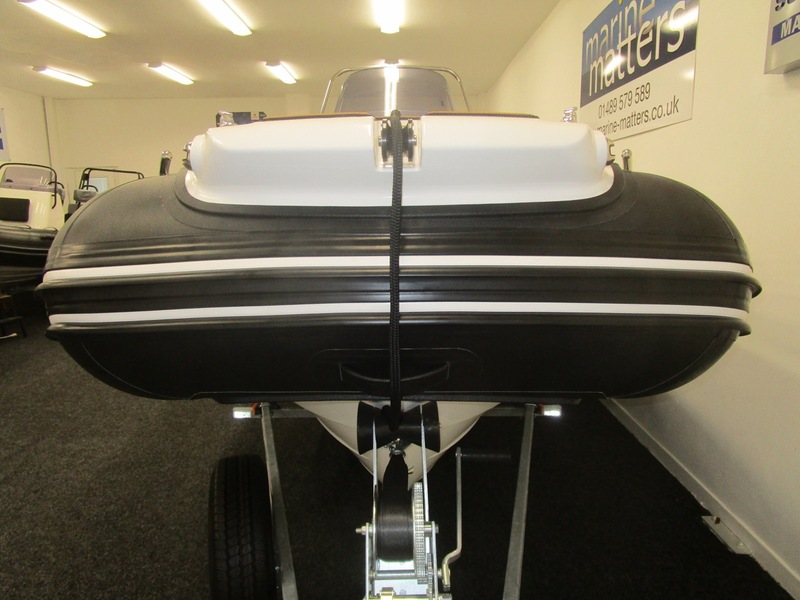 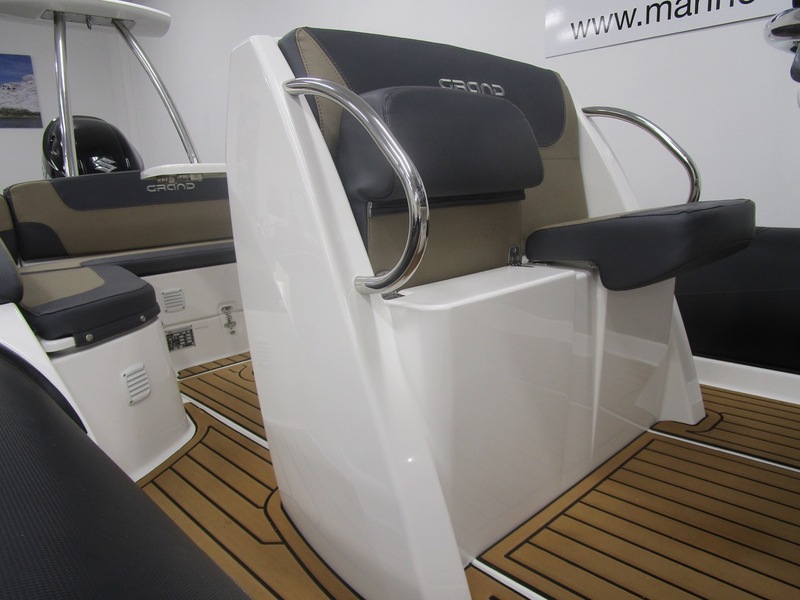 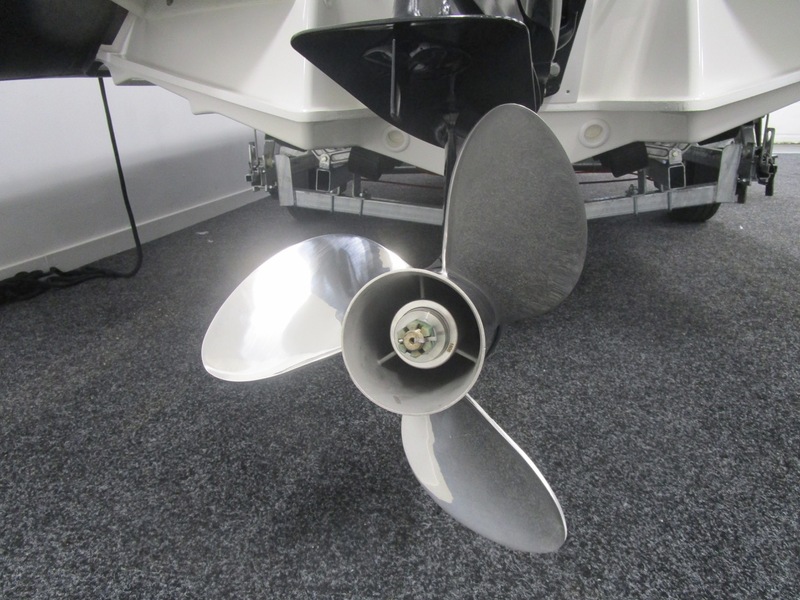 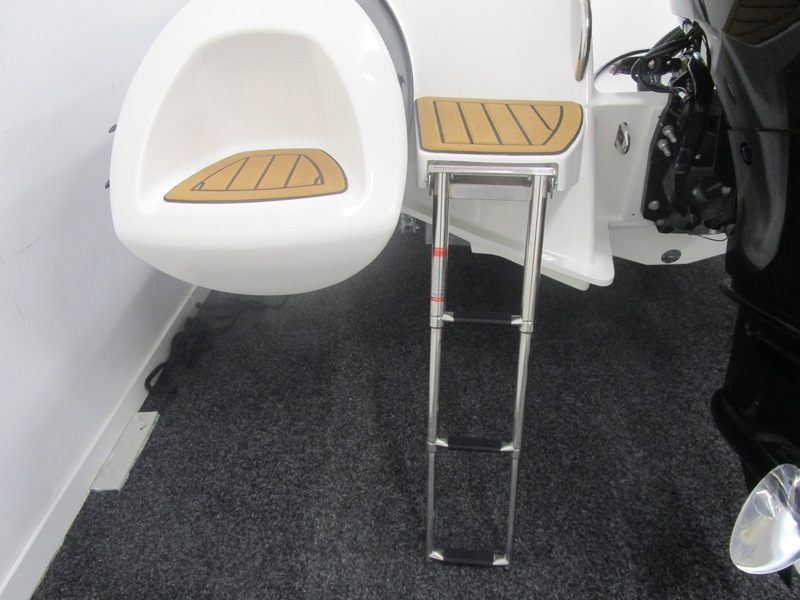 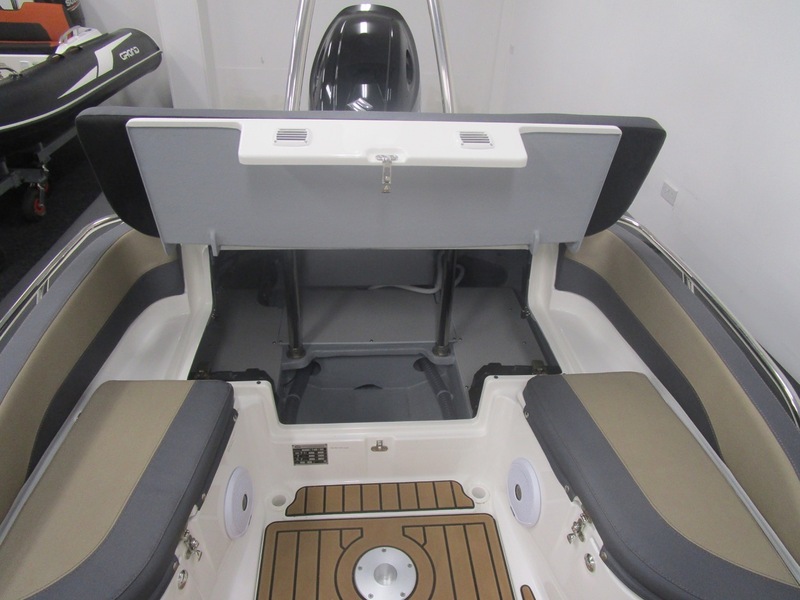 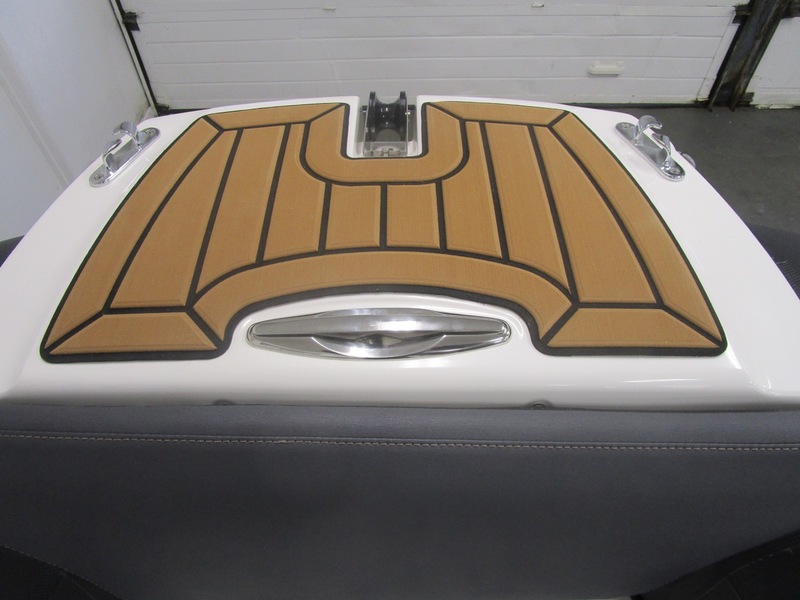 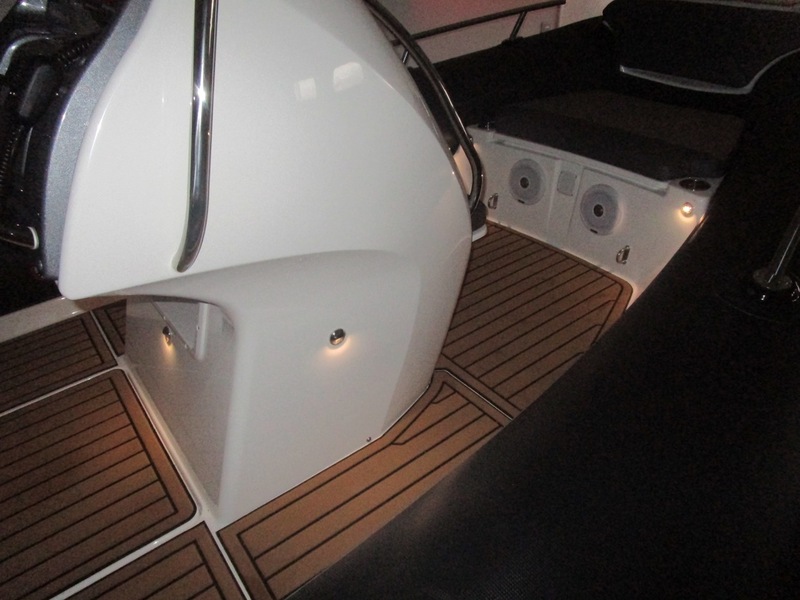 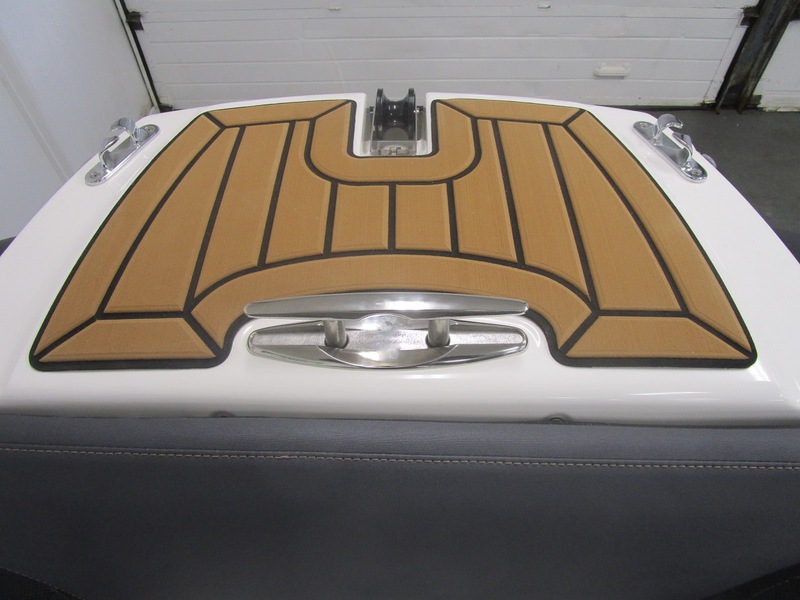 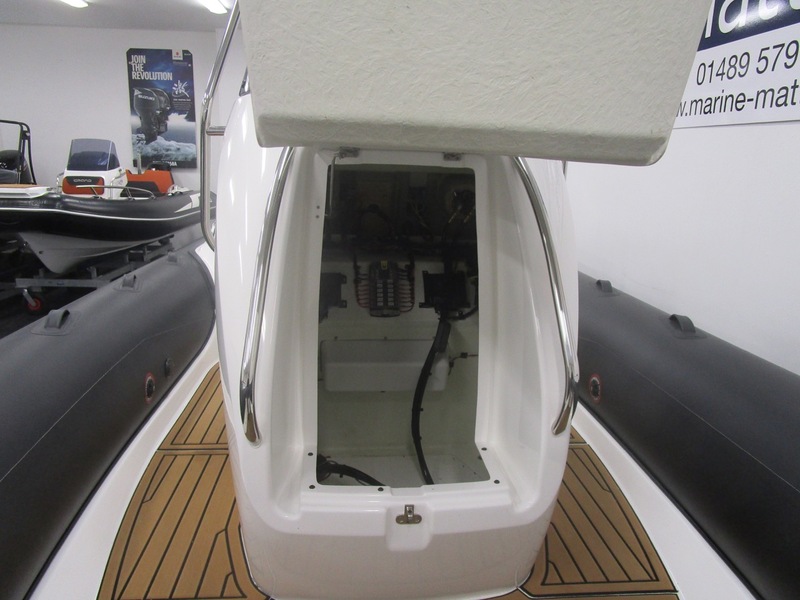 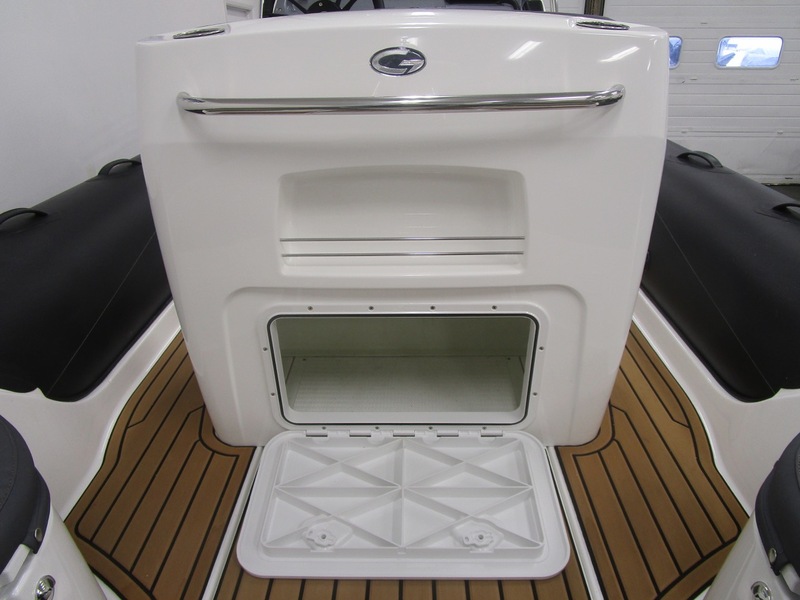 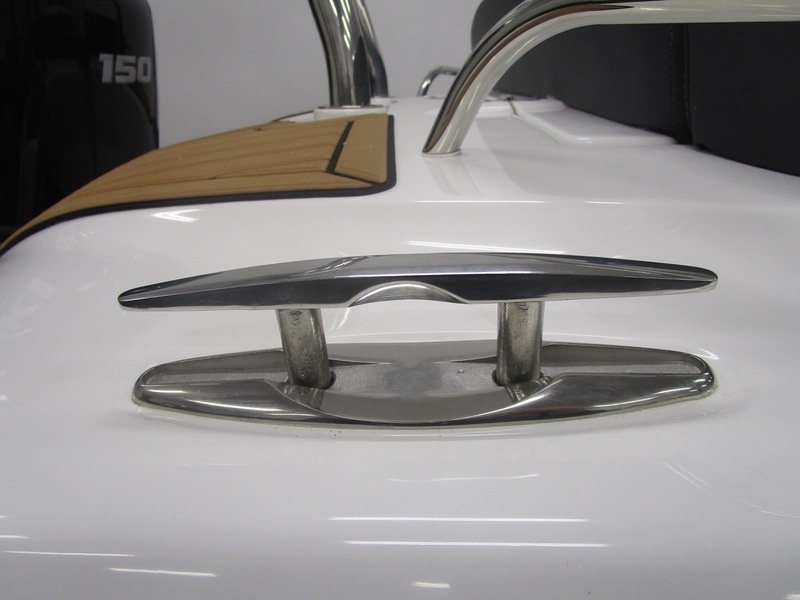 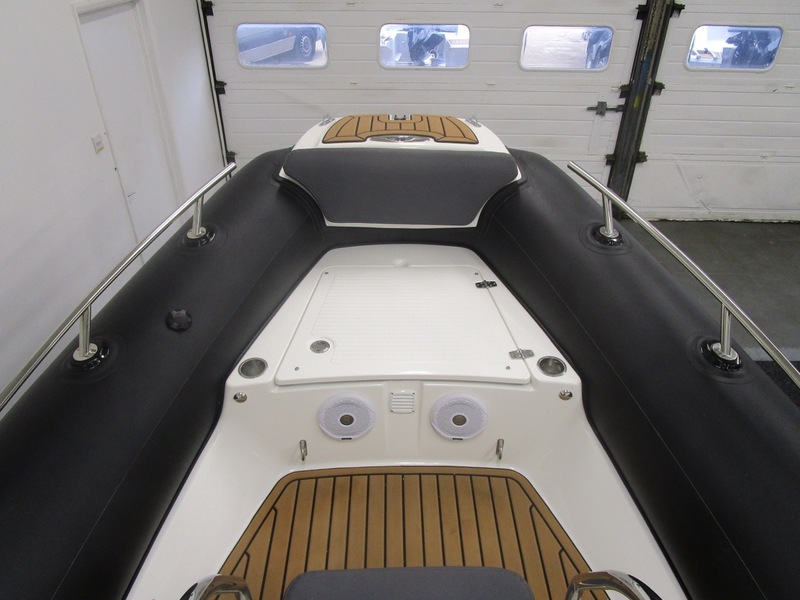 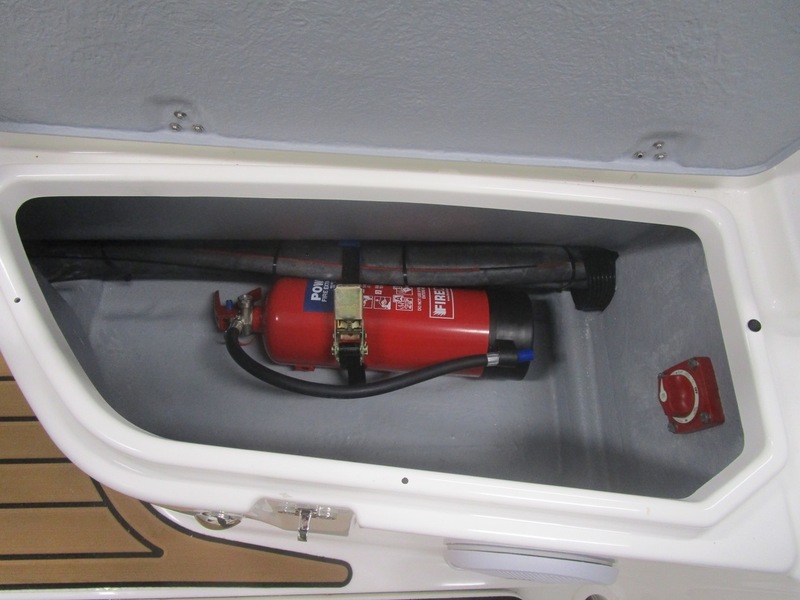 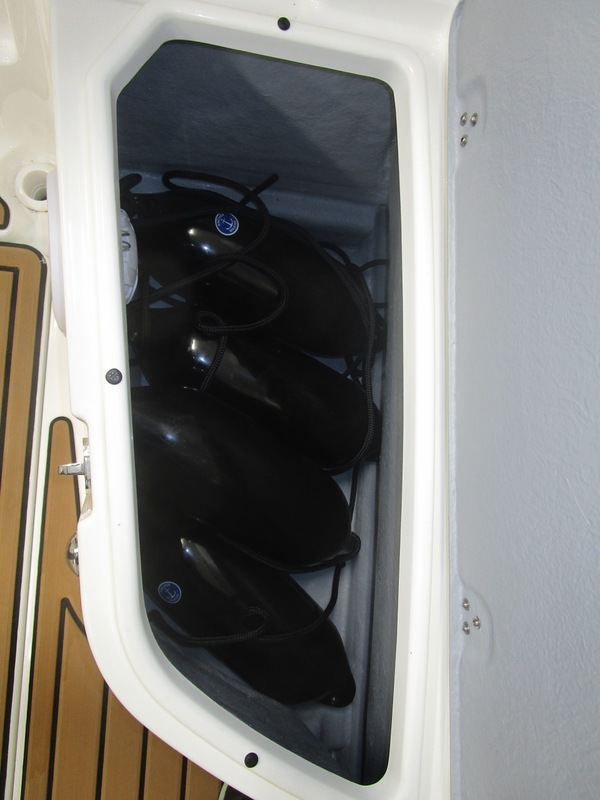 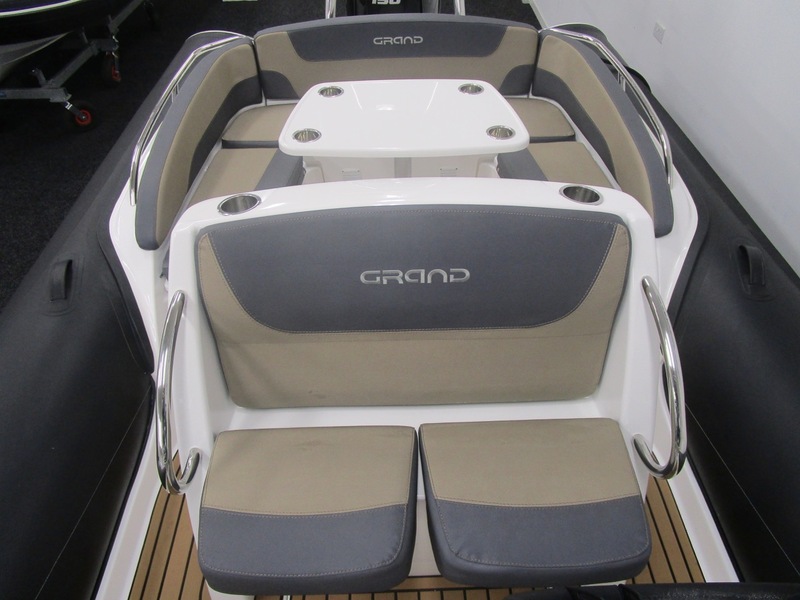 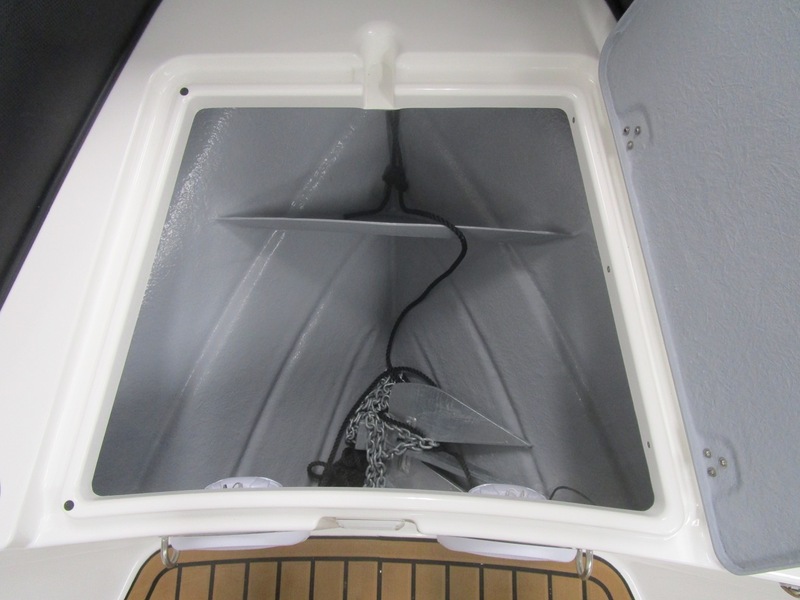 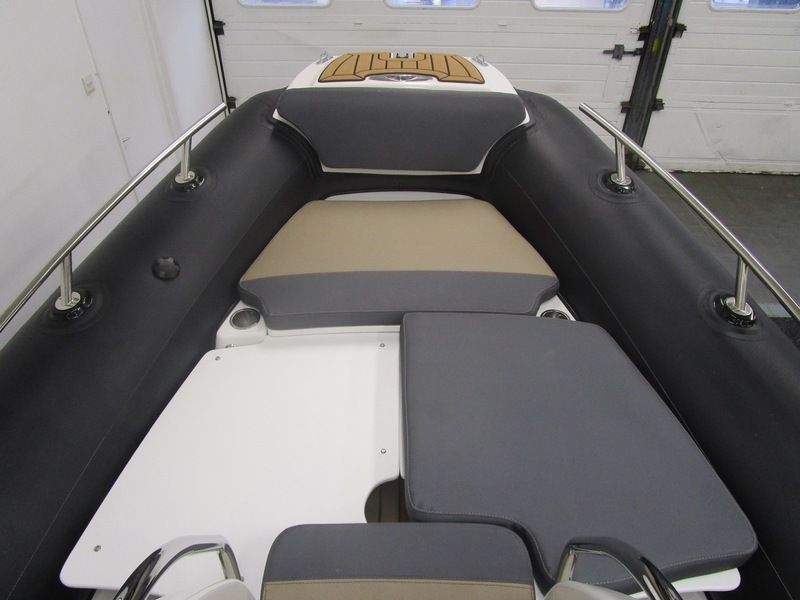 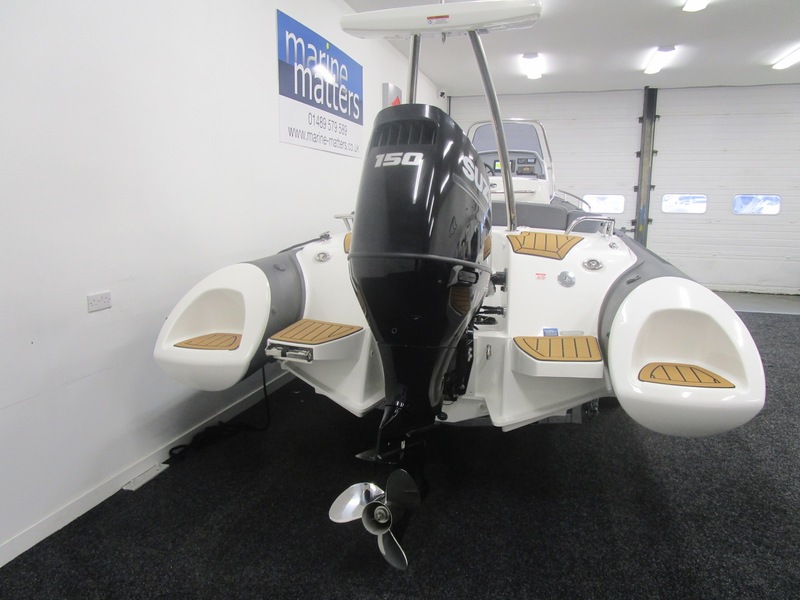 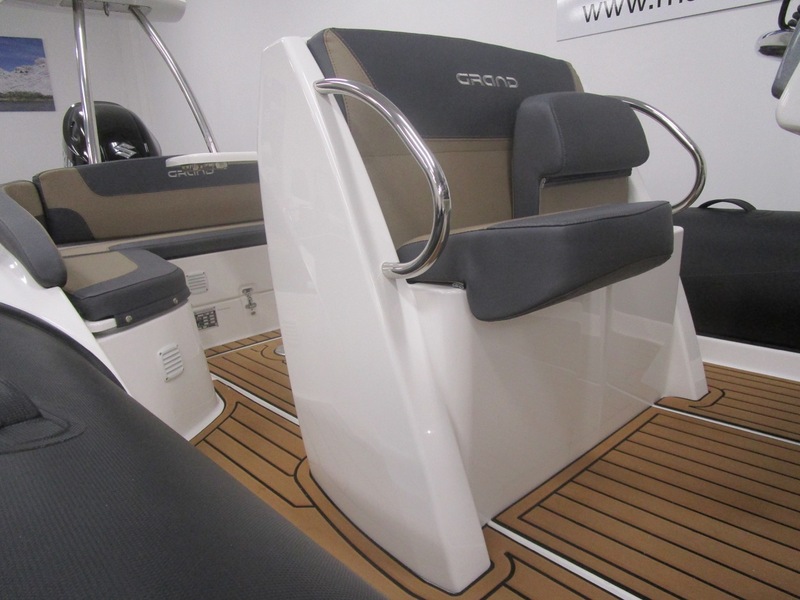 The SeaDek floor adds warmth and security underfoot, consequently we use this on the stern to ensure you do not slip when coming aboard via the telescopic bathing ladders after a swim or water ski thanks to the stylish ski tower. 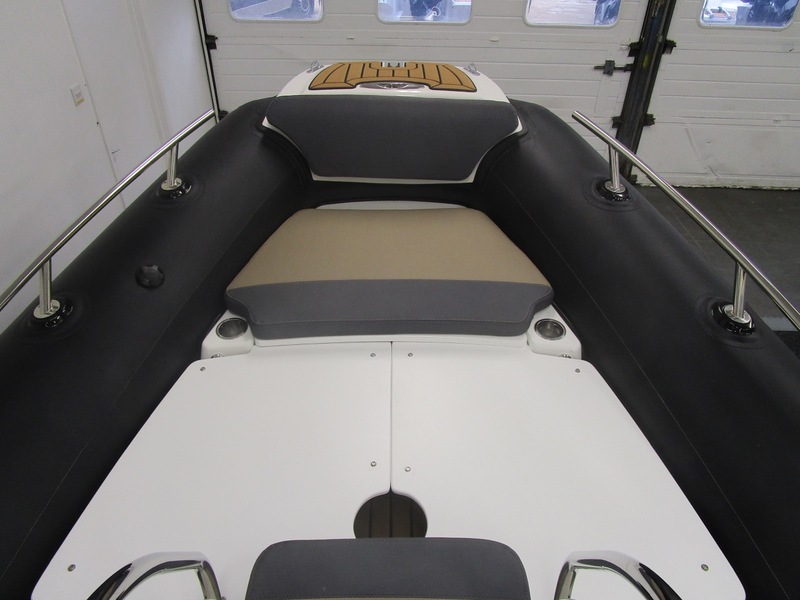 The plunging deep V hull cuts through chop as well as larger waves and will give you good service and a dry ride during local coast hopping as well for Channel crossings. 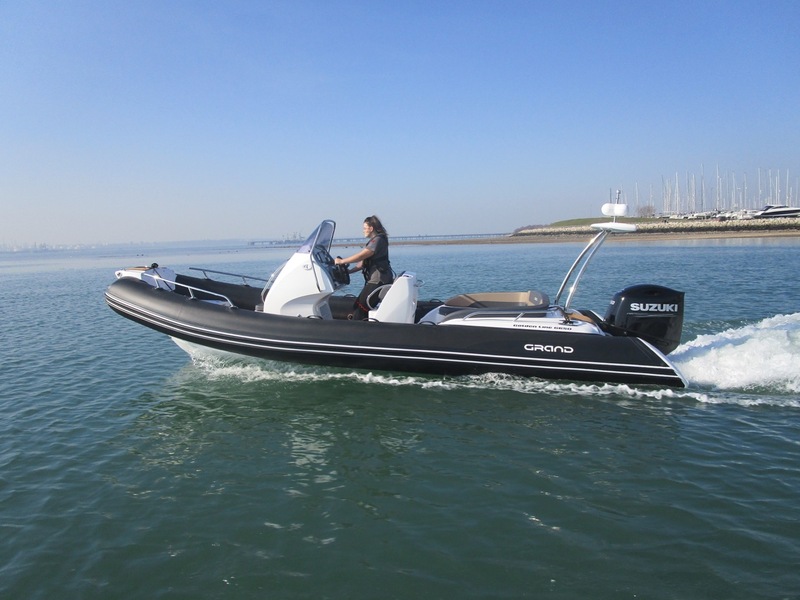 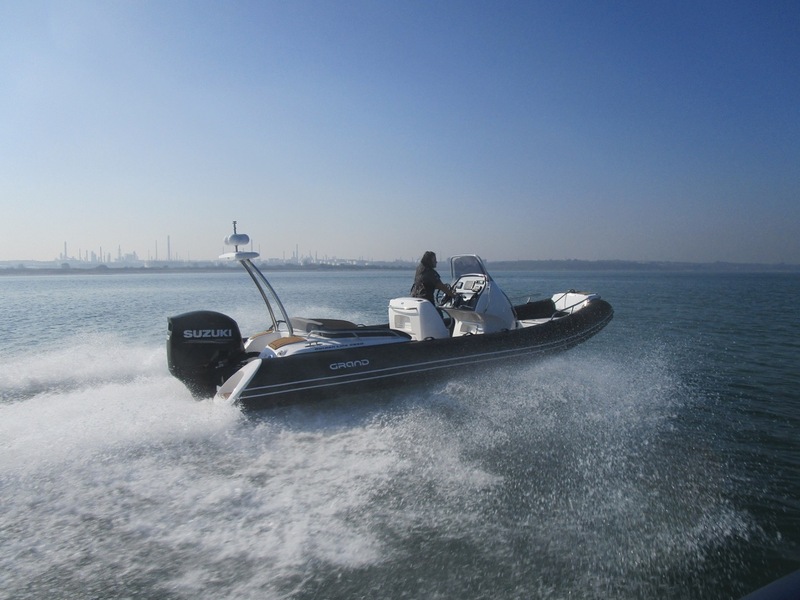 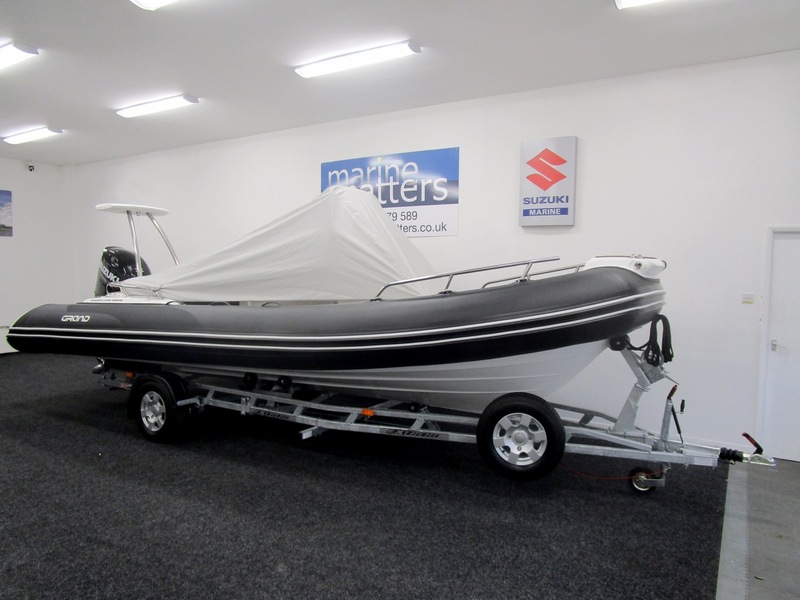 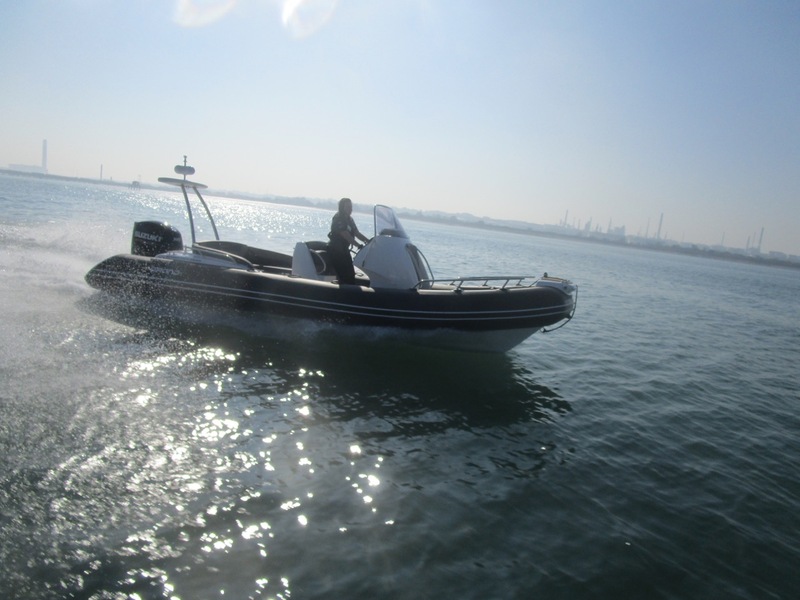 This cruising RIB has a host of non-standard extras making it a fantastic deal for anyone looking to be behind the wheel of the first choice RIB around The Solent this year.